Sakina Ibrahim (right) with two girls in her workshop at Wexler-Grant in New Haven. 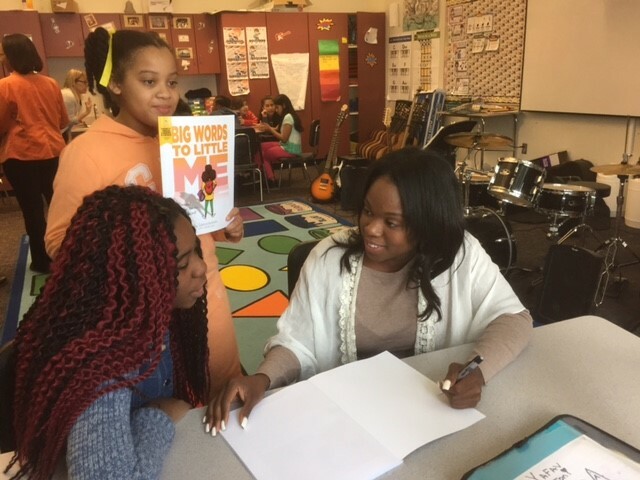 Sakina Ibrahim used her book “Big Words to Little Me” to present a workshop on self-esteem and affirmation to girls in fifth, sixth and seventh grades at Wexler-Grant Community School in New Haven on April 5. The hit presentation was part of the New Haven Police Department’s Community Wellness campaign, spearheaded by police Sgt. Shafiq Abdussabur. 25 copies of “Big Words to Little Me” were purchased by Read to Grow for the special program. Ibrahim is a writer and social entrepreneur. She is an NAACP Image Award nominee for Outstanding Literary Work for her debut book “Big Words to Little Me: Advice to the Younger Self.” She holds a Masters of Fine Arts from the University of California Irvine. She has worked as a dance educator while operating leadership and education programs with organizations such as the Dance Theatre of Harlem.